10 « July « 2012 « Nothing in Biology Makes Sense! 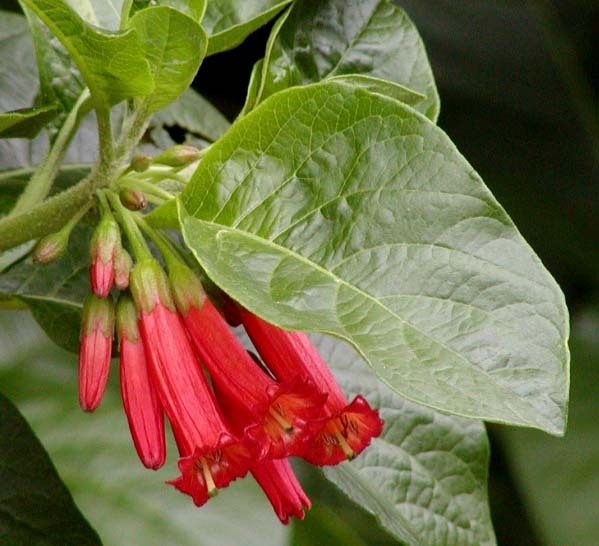 Iochroma fuchsioides. Photo via Wikimedia Commons. Vera Domingues presented a study of beach mice, which have evolved lighter fur after colonizing the sandy dunes of barrier islands off the Gulf Coast. As in many other animal species, a mutation at the pigment-related locus MC1R explains a lot of the color change; Domingues showed that in the population of barrier island mice, every copy of the mutant, “light color” form of MC1R is descended from the same ancestor, and that DNA sequence near the mutation resembles sequence from the ancestral population on the mainland—which suggests that the original mutant predates the move to the barrier islands. Richard Lankau showed how garlic mustard, an invasive weed in the United States, uses chemical warfare to out-compete native plants. Garlic mustard secretes chemicals into the soil that suppress the growth of other plants, and alters the environment for beneficial mycorrhizal fungi—and plants grown with competitors produce more chemicals. But native plants can adapt; samples of a native competitor collected from sites invaded by garlic mustard were better able to survive near the invader than plants from non-invaded sites, and were less able to benefit from mycorrhizal fungi in soil that hadn’t been exposed to garlic mustard chemistry.